I got to spend several hours on the river this morning, and all I have to show for it is this photograph of a toad. The one carp I spotted saw me first, and even though he eventually came back for another look, he decided the odds of swallowing my bread fly were next to zero. But the good news is this little guy, who was around five-to-six inches long. I saw him lazing in some slow water, surrounded by hundreds of tiny mosquito fish. This is the first toad I’ve seen down there, so my question is, Western Spadefoot Toad, Western Toad, or something completely different? According to my Audubon guide, it is a Western, possibly the sub species California Toad, Bufo boreas halophilus, and I say that due the diagnostic white stripe and the large size you speak of, and even then it would be on the large side. If you find out for certain let us know, creatures I find fishing I must identify. Westerns have the stripe, Arroyos (threatened) do not. Spadefoot have a vertically-slit pupil and a small black claw (spade) on their hind feet. 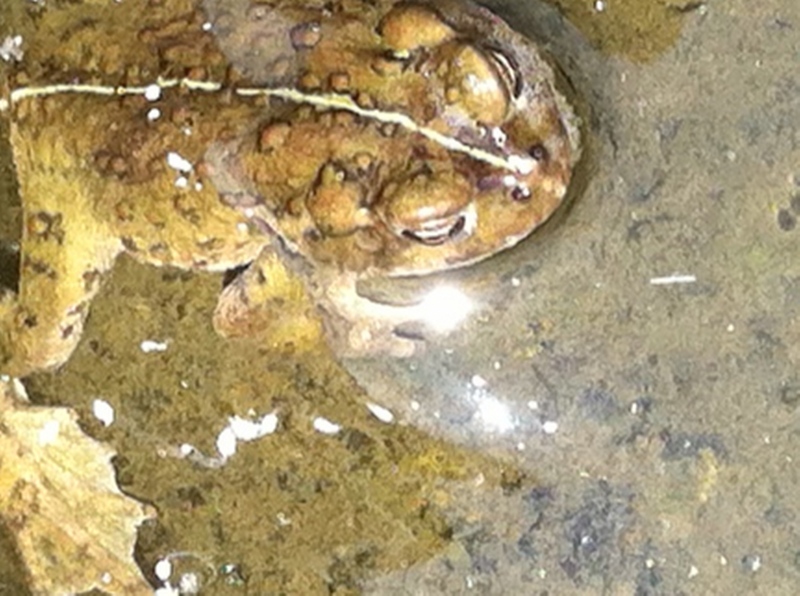 We used to have a ton of these toads in the Long Beach area, they lived in the cement drain channels….never see them anymore.